The future is here! Find out why you should choose us over our competitors. 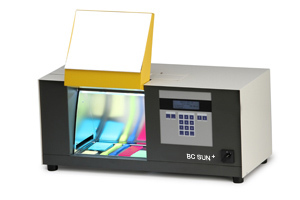 The BC Sun+ is only offered by Bottle Coatings to ensure that your product is truly safe from harmful UV exposure. We offer various levels of testing intensities from 1 to 24 hour exposure. With the BC Sun+ we can measure the wavelength of UV that we can use ranging form as low as 300 to as high as 800 NM. Please send us your current coated bottle and we will put it to the test.